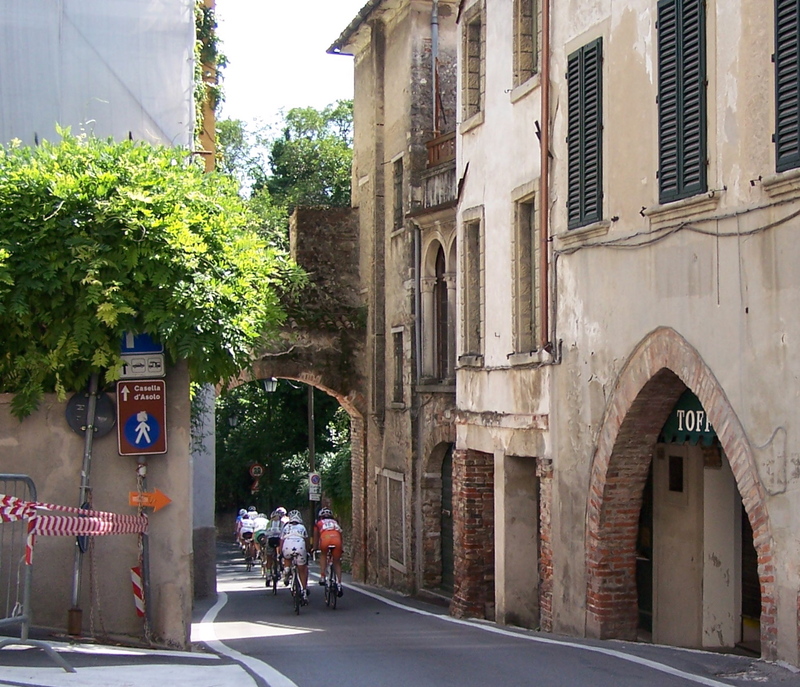 TRICOLOR WEEK…The Italian National Championships are once again being held here in Treviso province. Today it was the junior and elite women’s turn to take to the roads. 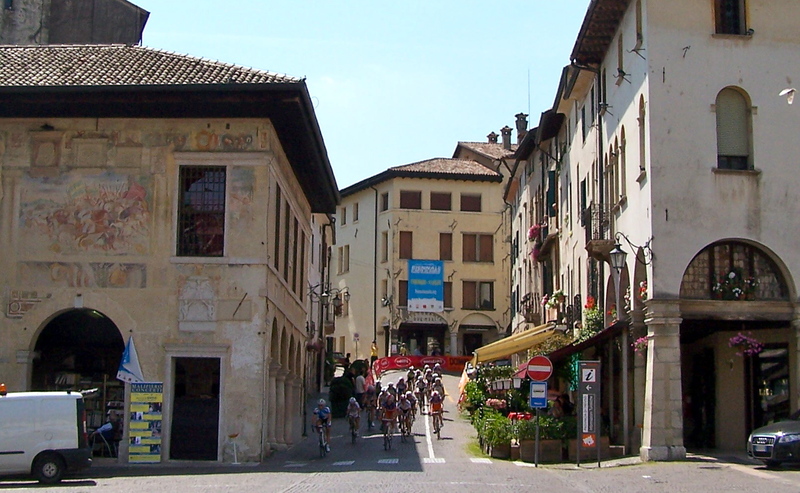 Their races started and finished in Riese Pio X (where a Giro d’Italia stage finish was held in 2007), and passed through the historic center of Asolo (as did the 2010 Giro). 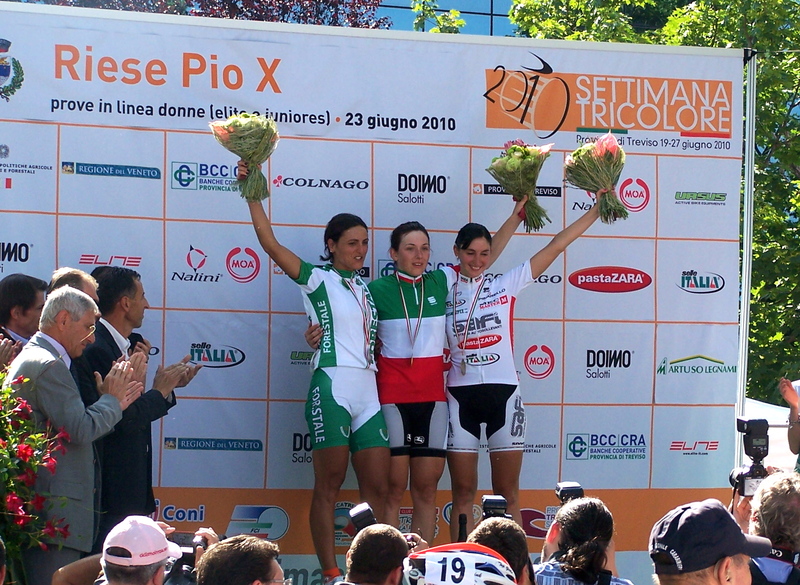 The women came up the Foresto di Pagnano, the only climb on the course, and descended the Forestuzzo. The elite women did 5 laps. I’d already planned the 4 spots where I wanted to photograph the race. There was plenty of time between laps to move from place to place and to chat with people I knew. After the second passage I was about to sit down at the Birreria Epoca for a piadina (flatbread sandwich) and beer when Bahjat, the owner and an acquaintance of mine, spotted me and invited me to sit with him and a friend at a table under the trees in the piazza in front of his place. It was a pleasant spot and the conversation was interesting and enlightening. After photographing lap #3 I enjoyed an ice cream at the Gelateria Browning, owned by Francesco, another acquaintance of mine. I was riding my cyclocross bike and wearing mountain bike shoes, which are great for occasions when you need to walk around a lot. I can also take unpaved shortcuts and detours that I can’t do on my road bike. And of course, I worry about the cx bike a lot less than my carbon road bike. I noted an elderly know-it-all type scrutinizing me and my cx rig. He thought he’d show how much more knowledgeable he was than some clueless woman. Italians have no qualms about saying what they think and can be quite impertinent. You need to put them in their place. (If you don’t understand the language, you may think they are being charming and paying you a compliment, when they are actually criticizing or making fun of you). “Oh, what wide tires you have there,” he noted with a faintly derisive air, as he pinched one of them between his thumb and forefinger. “That’s because it’s a cyclocross bike,” I replied curtly. “Don’t you see the brakes?” [‘cross bikes use cantilever brakes]. “You don’t actually ride it through the fields, do you?” he said with a rather sarcastic chuckle, implying that I was either incapable of such a feat, or that I’d gone out and bought the bike without even knowing what it was for…or both. 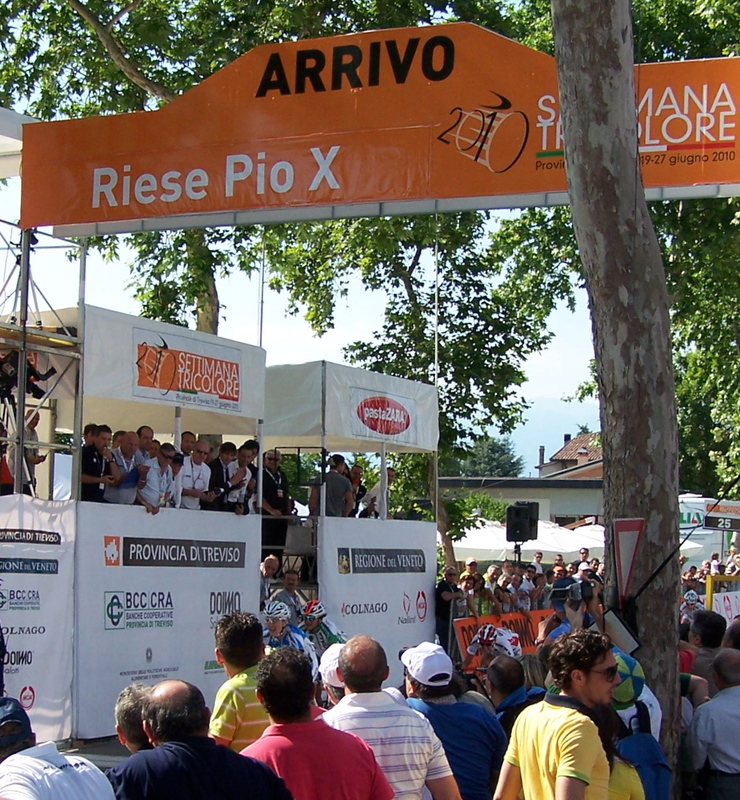 After the women had passed by on their penultimate lap, I headed down to Riese Pio X for the finish. I stood on a wall and had a great view of the finish line and podium. After the awarding of the maglia tricolore (tricolored jersey) I took a roundabout way home, bumping down picturesque farm roads without a care about the bad pavement, potholes and patches, enjoying the feeling of invulnerability that comes with plump, robust tires and a sturdy frame…and wishing that old signor smarty-pants could see me now. This entry was posted in Bicycle Races. Bookmark the permalink.